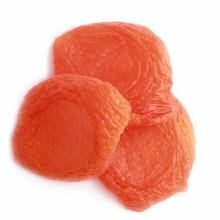 Our Fancy California Ruby Royal Sun Dried Apricots have a sweet-tangy flavor and moist texture with a dark reddish-orange color. Ruby Royals share many of the same flavor characteristics as other apricots thus making them great substitutions in recipes. If you have any questions about this product by Traina, contact us by completing and submitting the form below. If you are looking for a specif part number, please include it with your message.